Now that you’ve seen WHY the old way of marketing doesn't work and why you need a true SYSTEM in place to consistently attract new vein patients... click below if you are ready to discuss game-changing strategies to accelerate new patient acquisition in your practice. "We were working with other companies, but with ClinicGrower and Bref, we're getting GREAT results. 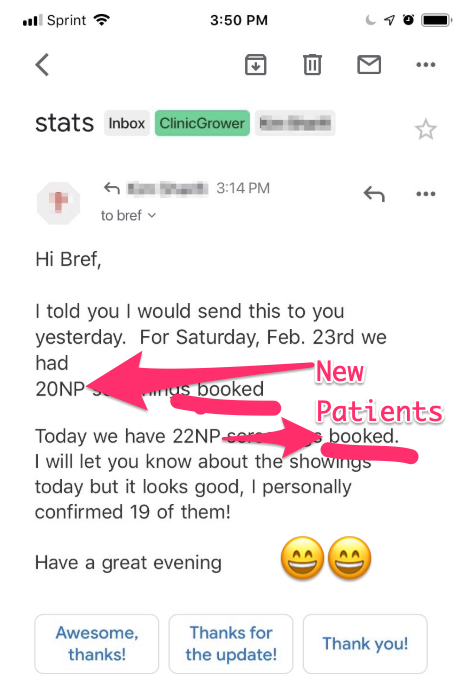 I highly recommend them"
"REAL PATIENTS WALKING INTO THE OFFICE...I've already referred multiple practices (to ClinicGrower)." IS IT OK IF WE BRING YOU NEW PATIENTS EVERY MONTH? NEW Patient Opportunities Every Day! "If you are looking for results..."
"Great results...increase in qualified leads...we get more patients and grow our revenue." GET MORE HIGH-VALUE PATIENTS IN THE DOOR - STARTING TODAY! DISCLAIMER: Any sales figures or results stated above are our client’s personal sales figures. Please understand their results are not even remotely typical, we are not implying you’ll duplicate them. In fact, if you do nothing, you can expect nothing. We use these references for example purpose only. Your results will vary and depend on many factors… including but not limited to your own business and sales systems, experience, and work ethic. All business entails risk as well as massive and consistent effort and action. If you’re not willing to accept that, please DO NOT APPLY FOR OUR PROGRAM. After the application page you may see an invitation to book a call with us. On that call, if you determine you’d like our help (and we feel you’re a good fit for our program), we may make you an offer to work with us. There is absolutely no obligation to do so, and you obviously do not have to take advantage of that invitation. Either way, our goal is to deliver massive value to you during the call so you know what’s working out there right now for the most successful med spas, plastic surgeons, and aesthetic practices. This call is 100% free.